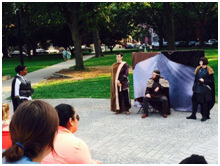 In a quasi-amphitheater setting that turned the steps leading down from the gazebo into audience seating and the circular walkway surrounding the gazebo into the stage for the play, the actors adorned in capes, boots, breastplates and leather accoutrements acted Edward III against a moving backdrop of kids playing ball, people walking their dogs, and commuters heading home from a long day at the office. Ben Forer who played King Edward paid the passers-by no mind as he began the play with Rhianna Latimer as Prince Ned and Conrad Arelius as Lord Audley discussing the King’s affairs. The only mishaps were when a sword wouldn’t budge from its holster, and a toddler on the loose entered – and stole – his scene. But Forer and the rest of the cast held tough even when a low-flying helicopter flew overhead and without further distraction, Edward wooed the Countess of Salisbury played by Rachel Matusewicz. In 1992, L. Robert Johnson founded Hudson Shakespeare in Jersey City and brought Shakespeare to the parks and schools. He later partnered with Jon Ciccarelli, who took over the reigns as Artistic Director after Johnson passed in 2010. Ciccarelli directed Edward III. Since then, Ciccarelli and his wife Noelle Fair direct the company’s season of Shakespeare and other plays. The team also works with Sarah Schlesinger who did the fight choreography for Edward III. 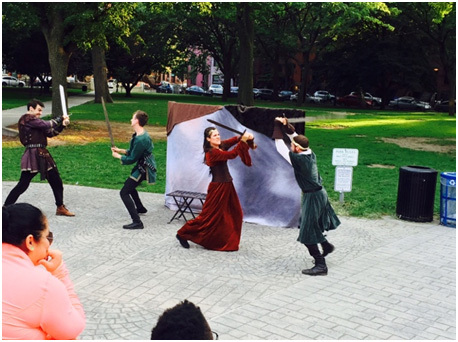 Hudson Shakespeare started out as a summer performances troupe and now does shows throughout the year in local schools, performing abridged versions of Shakespeare’s most popular plays like Romeo and Juliet and A Midsummer Night’s Dream. The program for Edward III states it was written by William Shakespeare and Thomas Kyd. When asked who Thomas Kyd was, and why he was getting billing with The Bard, Ciccarelli says the discovery was that The Bard collaborated with Kyd and wrote 40 percent of the play, while Kyd wrote 60%. This discovery came about through computer software designed by Sir Brian Vickers, a University of London professor to weed out plagiarizing college students. Ciccarelli likes to find obscure and rarely performed Shakespeare for Hudson Shakespeare’s repertoire. And he prefers casting actors who can be adaptable when performing outdoors.